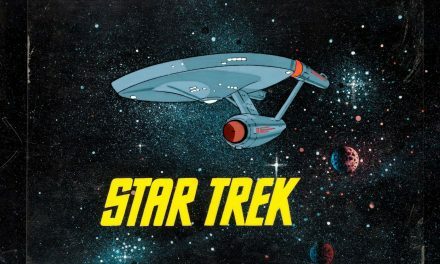 It’s a very long time since I’ve really WANTED to write about something I saw on television, and just couldn’t wait to get started on it. In fact, I recently told my friends and colleagues on the ‘Television for Women’ project, Helen Wheatley and Helen Wood, that I didn’t feel able to contribute to the CSTonline blog, mainly because I felt that, since becoming a parent and returning to full-time work, I am managing to watch so little television that I felt I would just have nothing to say. Then, The Great British Sewing Bee arrived on Tuesdays, BBC2 at 8pm. 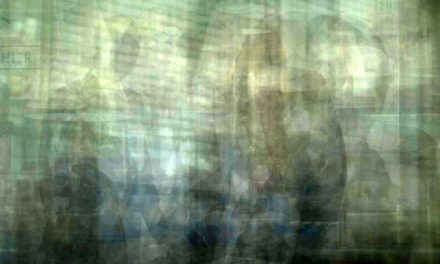 I made an appointment to view (or, rather, ‘catch up’) and, for the first time in ages, I feel like writing about contemporary television, prompted by a personal, deep-seated, passionate attachment. So, I thought, I’ll strike while the iron’s hot (pun intended) and commit a few thoughts to the blog on the pleasures, or otherwise, of watching (competitive) sewing on television. 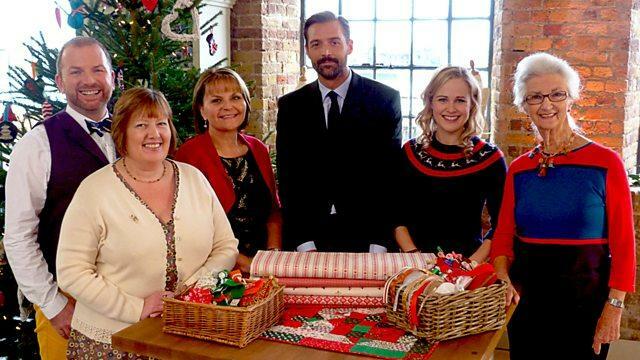 The Great British Sewing Bee is the most recent programme from Love Productions, who brought us the incredibly popular The Great British Bake Off, on which amateur bakers were pitted against each other. Similarly, Sewing Bee features eight amateur ‘sewers’ spanning several generations and different kinds and lengths of sewing experience, given a variety of sewing challenges and tasks (following a pattern, making an alteration, made-to-measure) to complete in competition with each other, in the same space, and within strict time constraints. Sewing Bee is only four episodes long, however. 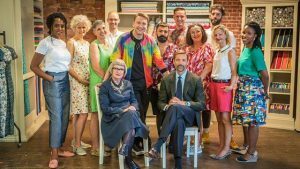 The results are judged by Saville Row menswear designer Patrick Grant and WI dressmaking teacher May Martin, and two contestants are eliminated in each episode. The show is presented by the ubiquitous Claudia Winkleman who, as with her role on Strictly, is the unskilled observer, acting as mediator between a particular kind of viewer (non-sewing) and the rest of the participants. Sewing Bee raises lots of questions about television genre, gender, temporality and viewing pleasure which I’d like to address, and I’m going to start with the programme’s use of terminology. ‘Sewers’ is the peculiarly awkward gender-neutral term used by the show to describe its female and male participants. I have never encountered this term before, and it made me think about the very gendered terms which are usually used to describe those who sew: ‘seamstress’ and ‘dressmaker’ both indicate women sewing and, certainly in the case of the latter, also suggest the making of women’s clothes. ‘Tailor’ usually implies a man, sewing men’s clothes, professionally, where the female nouns might refer to either amateur or professional sewing (much like the use of ‘cook’ and ‘chef’, I suppose). The awkwardness of the term ‘sewer’ is, I think, quite suggestive of the slightly uncomfortable inclusion of men as participants in a programme about sewing clothes: of the two male participants (the show of course includes short vignettes which show each participant’s home, family, friends and other sewing experience and garments/objects produced), one is gay and more experienced in ‘craft’ sewing such as quilting than tailoring, and one is an HGV mechanic, a married man with children who sews his own elaborate and historically accurate costumes for the historical reconstructions in which he participates. As the only two male contestants, then, they are both produced in various ways as ‘unusual’ in their interest in and dedication to sewing. While the programme makers were obviously determined to include men who sew alongside the perhaps more expected and experienced women participants, the ‘ungendering’ of this programme remains slightly uncomfortable, despite (or possibly because of) the presence of a professional tailor in his role as judge. I’ve written before about the ways in which factual entertainment television has ungendered activities, genres and tropes previously understood as ‘feminine’ (including cooking and fashion) and with The Great British Sewing Bee we have the latest example. It’s interesting, though, that the show has focused on the ‘different’ sewing skill of its two male contestants, in both positive and negative ways. In Episode One, Mark won the tailored dress task, more, it was made clear, by luck than judgement, as his pattern just happened to fit his model, rather than having been tailored specifically to her, demonstrating ‘skill’. In Episode Two, neither Mark nor Stuart could get their heads around constructing a fly zip opening, instead inserting a normal zip fastening into the pair of men’s tailored trousers they were tasked to make from scratch in four hours. In the same episode, Stuart won the patch pocket challenge with his ‘crafty’ tulip pockets which were based upon his appliqué experience and also won the blouse challenge with a complex cheongsam-style top, presented as a ‘surprise’, while Mark was one of the two contestants to leave because the choice of a flowing, eighteenth-century chemise he’d made many times before for the ‘blouse’ challenge was not executed to high enough technical standards (the application of the collar was incorrectly done, creating messy bunching on the neck seam, which he had hoped that the romantic, historical style of the garment would disguise. It didn’t). 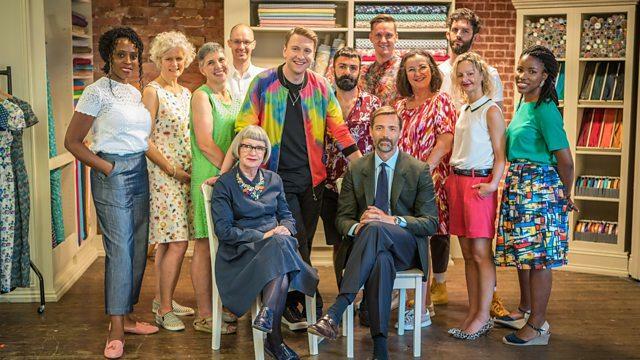 It will be interesting to see how the ‘craft’ sewing expertise of Stuart, the remaining male contestant, will fare against the years of home tailoring experience of the remaining female dressmakers…. I suppose what I’m getting at here, as one of the investigators on a project about the history of television for women, is that while this show is trying overtly to ungender itself, this is likely to be a difficult task. 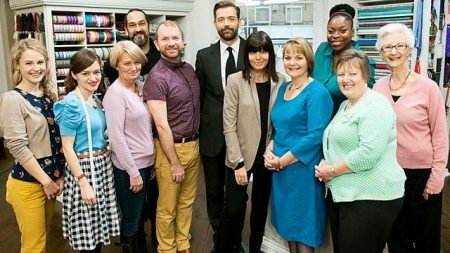 It is difficult not to see The Great British Sewing Bee as women’s television, not least because, historically, culturally, women have typically been the ones to sew for the home, the family, for pleasure, while men’s sewing has been professionalised in the fashion and garment industries. I was prompted to contribute this blog on Sewing Bee partly because of my experience of watching the first episode. I just happened upon it while staying at my parents’ with my husband and three-year old son; we were all watching TV together when it came on and, while the ‘boys’ carried on playing trains on the floor, my mom and I, who were both also knitting, became completely absorbed in the television, talking to it and to each other about it, simultaneously (as Helen Wood observed in Talking with Television). This might not seem unusual, apart from the fact that my mother and I cannot agree upon anything, let alone television viewing, at the best of times. At this moment, however, as reasonably experienced dressmakers, we were able to share knowledge, opinions, expertise and even to agree on our assessment of what was happening in each contestant’s work. We would say the same thing, simultaneously: “look at the puckering on that dart! !” or “That’s not how you put in a concealed zip!” On one hand this is just evidence of our acceptance of the invitation so often proffered by reality television, to occupy a position of superiority in relation to the on-screen participants, whether that is superiority in terms of parenting ability, cooking, household management, or, in this case, sewing. On the other, it is suggestive of one aspect of the address of this particular programme, an address to an audience with particular experience, knowledge and competences (competences which are, in our culture, most typically gendered feminine) and our pleasure in experiencing and responding to that address, seeing that those competences displayed on television as something difficult, worthwhile, valuable, recognised. We could connect over that. This is not to say that sewing has not featured on British television before, of course. Women’s daytime television in the earliest period often featured items on sewing (for example on Leisure and Pleasure [1951-55]); there have been a number of dressmaking series such as BBC’s 1976 Dressmaker and the several instructive series featuring sewing guru Betty Foster in the 1980s. More recently, of course, there has been the US show Project Runway, though this is as much if not more about fashion design than sewing. We haven’t, though, seen a programme on British television which showcases the skill of dressmaking, for a very long time, and I’d like to reflect a little on how sewing works, or doesn’t work, on television, and about the weirdness of competitive television sewing. Sewing is, generally, a pretty solitary business. You can’t really do most kinds of sewing while watching telly, or even talking to someone, like you can with knitting or crochet. Most people who sew clothes like to do it in a room on their own, in peace and quiet, and, most importantly, at their own pace. You just can’t rush the cutting of fabric, the setting in of a sleeve, the top-stitching of a laboured over garment. It’s a relaxing pursuit, when done for leisure, for all its fiddliness and occasional frustrations. Hence, the first weirdness of The Great British Sewing Bee: putting ‘sewers’ all in the same room, and turning a typically solitary pursuit into a competition with rigid time constraints by making dressmaking/tailoring the basis of a television competition programme. This has been a main topic of discussion between me and my friends who sew: the programme delights us, as sewers, because its speaks to and recognises our passion and skill, one which isn’t often openly celebrated any more. At the same time, though, it genuinely distorts the practice of sewing clothes, precisely because of the formal constraints imposed by the generic form of the competition show – particularly those around temporality. One might, in practice, spend the time allowed by Sewing Bee for the making of an entire garment, on getting one aspect of it absolutely right. As one of the contestants, Tilly, commented as the pressure mounted towards the end of a task: “I’ve got a herbal tea in front of me….I’m trying to pretend I’ve got the music on and I’m sitting at home on a Sunday afternoon.” This distortion of the true temporality of sewing by the programme also impacts upon the programme’s aims and success as factual entertainment programming; the programme includes segments in which some of the tasks set for the participants are explained using either on screen graphics and a voice-over, or a rapidly-edited live action demonstration. In either case, as is also true of the show’s inserted demonstrations of how to make a simple household object (Episode One: a laundry bag, Episode Two: a cushion cover) the demonstration is too curtailed to be of any practical value for the viewer inexperienced in sewing. 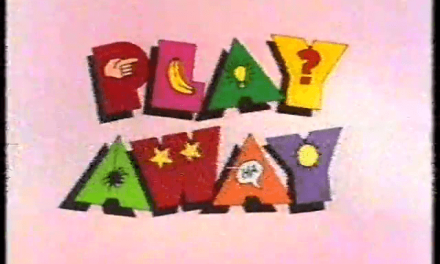 Not even using pause on digital devices would enable the instructions on how to make a simple object to be followed; the image above is all the visual accompaniment to the instruction in the caption, which won’t mean much to a non-sewer anyway (though in this instance the instructions were repeated in the Radio Times [30 March – 5 April] in the article accompanying the show’s launch – it’s a long time since I’ve seen a sewing project in a general readership magazine). The description of the correct way to perform a complex task set to the participants (e.g. a concealed fly fastening, a rolled hem) is illegible even with digital aids, despite the fact that the show clearly intends to give the impression of having and educative aim. It is clear that The Great British Sewing Bee has a double address: the same moment in the programme (for example a brief shot of a steam iron being used to shape fabric) can offer pleasurable acknowledgement of the skill involved in sewing clothes to the experienced sewing viewer, while at the same time, hinting to the viewer who is a ‘sewing virgin’ at the arcane practices of dressmaking without actually revealing their mysteries. There has been quite a bit of discussion of The Great British Sewing Bee, in newspaper television criticism (Tom Meltzer’s review in the Guardian found it deeply dull, compared to Bake Off), on crafting websites such as www.stitchcraftcreate.co.uk and on Twitter, Facebook and online sewing blogs. Soaring sewing machine sales have been reported (and John Lewis and Liberty are advertising their haberdashery departments using #GBSB) while sewing enthusiasts on Twitter and Facebook have welcomed it with enthusiasm and excitement. It is those viewers who sew, it seems, who are gripped by Sewing Bee. In her 2004 piece ‘Taste and time on television’ (Screen 45, 2) in which she looks at the history of British lifestyle television and particularly at craft television, Charlotte Brunsdon wrote about the temporality of earlier ‘craft’ television ‘presented by an enthusiast, which aspires to generate a matching enthusiasm in its audience’ (122). Looking at Sewing Bee through Brunsdon’s argument, we can see the historical shift in television grammar and temporality. As she also argued elsewhere, in contemporary factual entertainment television the close-up is no longer instructional, but rather melodramatic. Here, I suggest, the close-up is largely obfuscatory. While the close-up is used here to show the detail of a process badly or well-executed, they only demonstrate the ‘what’, and not the ‘how’. 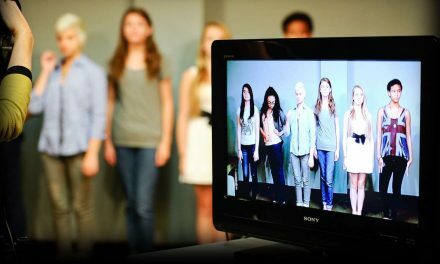 The programme also invokes the usual reality television melodramatic visual rhetoric of close-ups of participants’ frustrated and distressed faces, in one particularly odd moment, editing them together to show participants surreptitiously trying to catch a glimpse across the room at their competitors’ progress. Baking, cookery, has often been presented as difficult, stressful and even competitive, but this just feels very strange, wrong, even, for dressmaking. It’s just not a competitive activity. So, I think the generic form of the programme distorts the inherent temporality of sewing. Bizarrely, though, it does also replicate the pressure I sometimes feel when I make clothes these days: with a demanding full-time job and three-year-old, precious sewing time is scarce and is now usually squeezed in very early in the morning or very late at night. I don’t have as much time as I did to sew, which means it takes longer to make something, projects pile up, waiting, in the front room, haberdashery and patterns ready to go, imagined, but unstarted. When I sew now, I’m often thinking in terms of time constraints: “If I can just get it cut out before I go to bed” or “If I can just get the bodice tacked and ready to sew before they get up” and yet, simultaneously, I am also trying to carve out this time as leisure, listening to music, having a glass of wine at the sewing machine. I feel as though I’m going over old theoretical ground here, not just about the changing address and aesthetic of lifestyle television, but also rehearsing arguments about gendered competences in television addressed to women (Brunsdon) and women’s television reproducing and reinforcing the temporality of the condition of its viewers’ daily lives (Modleski). Nevertheless, it’s true, in this case at least. Like the women preceding me on both sides of my family, I have ‘done dressmaking’, for as long as I can remember. Some relatives were professional seamstresses and milliners, some amateurs; I just sew for pleasure, making and altering clothes for myself, my friends and, more recently, my little boy. I learned from my mom, my grandmothers, my aunt and taught myself the parts I didn’t get from them. I don’t really share much about this, other than when I take on little jobs for friends or get a compliment on something I’m wearing that I made – I’ve always been the only one of my generation in my social circle who does it. Recently, it has been noticeable that much younger women I know are starting to sew their own clothes, knit and crochet with both passion, skill and commitment, often despite incredibly hectic personal and professional lives. Sewing, dressmaking in particular, seems to be enjoying a cultural renaissance; there are increasing numbers of sewing and knitting communities connecting via social media and, like the ‘domestic goddess’ reinvigoration of home-baking and certain kinds of vintage style, I think this is often perceived as part of a wider tendency towards a conservative, postfeminist nostalgia for a pre-feminist past, when women, free of the pressures of professional paid work outside the home, are imagined to have baked, sewed and knitted, smiling, in their stylish, mid-century homes (and the 1950s and 1960s non-diegetic popular music used on Sewing Bee certainly reinforces this). This is, however, not always how and why women sewed (as Barbara Burman’s wonderful 1999 collection The Culture of Sewing: Gender, Consumption and Home Dressmaking demonstrates) and I also suspect that this isn’t a complete picture of its contemporary revival. I think there is also a desire, embedded in this renaissance of sewing cultures amongst young women who are perhaps less likely than me to have learned to sew from their mothers, to preserve and continue the skills (and pleasures) of historical women’s cultures, whether there is an existing personal connection there or not. This is, I think, a distinctly feminist rebirth, despite its undoubted connection with the current nostalgia for the pre-feminist past (as addressed by Lynn Spigel in her piece on Pan Am and Mad Men in the dossier on ‘Television for Women’ in the next issue of Screen). I briefly entertained the idea of applying to take part in The Great British Sewing Bee; now that I’m watching it, and though I’m loving it, I’m really glad I didn’t. I’m sure I wouldn’t have been chosen to take part, but if I had been, I think participating in competitive sewing would have completely dismantled my pleasure in my favourite leisure pursuit, one which I try to make free of stress and pressure. Unlike many women in the past, I have the luxury of sewing for leisure and pleasure rather than out of necessity, even though I usually do it within certain kinds of constraints. I’ll keep it that way. I will, though, no doubt continue to enjoy shouting at the telly about poor fit and incompetent zip insertion. Dr Rachel Moseley is Associate Professor in the Department of Film and Television Studies at the University of Warwick. She is one of the investigators on the AHRC project ‘A History of Television for Women in Britain, 1947-1989’, and, in other research, is working on a book about Cornwall in film and television.